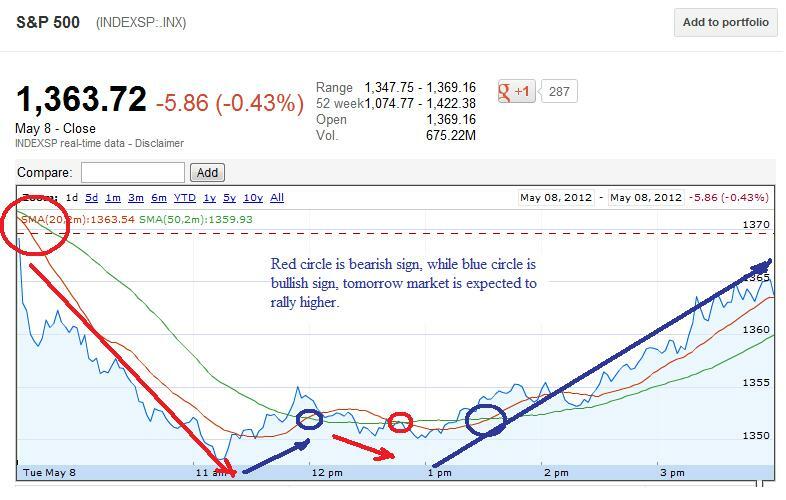 A strange day of trading. Focus back on Greece default. In past 6 month, whenever ECB printed money, most of the time market have rallied upside eventhough chart were pointing toward sell off. 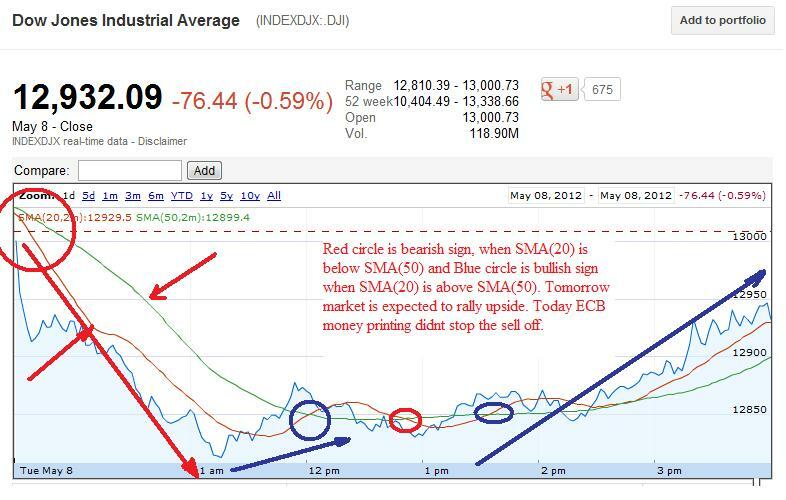 Based on the chart, today market was expected to sell off but since ECB was printing money market was expected to rise. There were so many strange things that happened today. Greece is having problem of forming government and it may have to conduct another round of election. Greece has 5 week from now, before it's cash will be over. So, Greece is not in a position of another round of election. Either, Greece have to exit eurozone or it has to officially default. Merkel commented to France President Hollande that there will be no negotiation on European union fiscal pact. Both this problem existed yesterday but the market didn't sell off but today it became main issue for sell off. 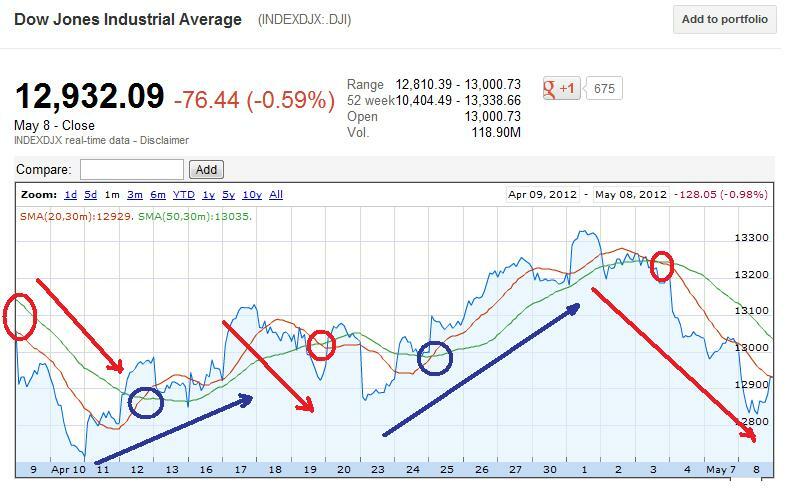 Dow was down 196 and then it rallied up 126 point and S&P500 was almost down 22 point and it rallied up 16 point. Based on the chart, tomorrow Dow and S&P500 is expected to rally upside as its back into bullish zone. The first level to check on Tomorrow in Dow for upside is 13000 followed by 13032 which is important break point for the upside. While for the downside, Dow needs to break 12908 followed by 13865. The first level to check on Monday in S&P500 for upside is 1372 followed by 1375 which is important break point for the upside. While for the downside, S&P500 needs to break 1358 followed by 1355. Dow zone started in bearish zone but at the close its back into bullish zone and tomorrow market is expected to rally upside or atleast end up flat. Dow 1 month chart is still in bearish zone but at a breakpoint where it could go higher. 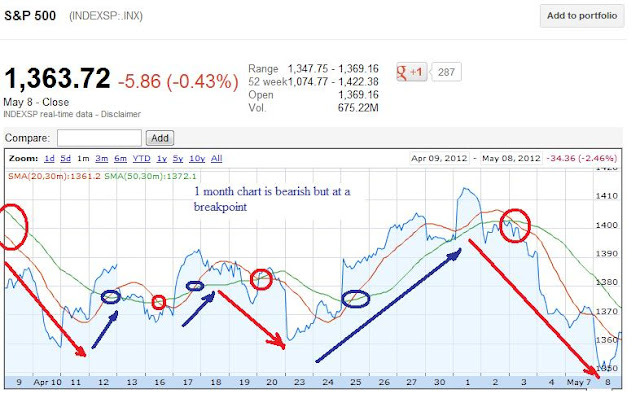 S&P500 1 month chart is in bearish zone but at a breakpoint where it could go higher. The only economic data coming out tomorrow is Oil inventories at 10.30 EST, a built up in inventory is bearish sign, while a decline in oil inventory is bullish sign for ERX or any oil related companies.